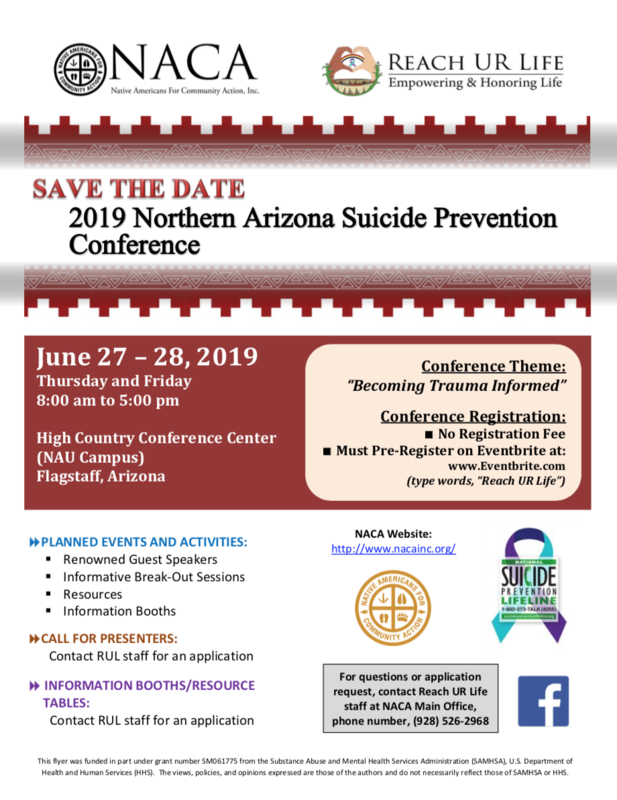 FLAGSTAFF — The 2019 Northern Arizona Suicide Prevention Conference will be held from 8 a.m. to 5 p.m. Thursday and Friday, June 27 and 28, 2019 at the High Country Conference Center, NAU Campus, Flagstaff. Presented by the Reach UR Life (RUL) Suicide Prevention Program and the Native Americans for Community Action, Inc. (NACA), the conference will feature renowned guest speakers, informative and educational breakout sessions, important resources for professionals and community members, and plenty of networking opportunities for all attendees. Topics highlighted at the conference will relate to suicidal ideation and trauma, suicide prevention strategies and models, trauma and self-care, Zero Suicide, LGBTQ concerns, veterans and suicide risk, bullying, youth empowerment, and much more. Do you have information you would like to share at this year’s conference? If so, please review the Call for Presenters attachment for more information. If you are interested in presenting at the conference, please complete and submit the attached Presenter Application to the RUL program. The application is a fillable document. To help us process your presenter application, please fill in your information in the text boxes and send to the RUL program. The deadline to submit a presenter proposal is Wednesday, April 17, 2019. Notification of acceptance will be sent out by Wednesday, May 1, 2019. The duration for each presentation/workshop will be 45 minutes followed by 15 minutes for evaluation/Q&A. For activity classes, presenters should plan on a 60-minute routine. There is NO registration fee for the conference. All attendees and presenters mustregister for the conference. Please know there is only one ticket per person, so each person must register individually with their own name. There are no group registrations. If in the event you are unable to attend the conference, please cancel your ticket so that we can give your seat to another person. Should you have any questions, please do not hesitate to contact the RUL Program staff at (928) 526-2968.